Plenty of Sewing. Not Enough Blogging. My poor, neglected blog. Sewing a garment every week has been this breathless, thrilling, and crazy distraction in my life. These days I can barely keep up with my laundry, let alone a website. Though, I am getting the hang of things over at The Sew Weekly. That means there’s hope yet for this place. We’ve completed seven garment challenges so far and I’m going to give a brief recap of what I made for each. After this post, we’ll just consider ourselves caught up and I’ll move on to where my head’s really at: next week’s “Refashion” challenge. Week 1 Challenge: You Can Do It! Introduce yourself & share a favorite garment of 2011. I shared the “Meet & Greet” Tunic and little bit about myself in a brief interview. Week 2 Challenge: Accessorize! Make a garment inspired by an accessory. After my plans for a skirt fell apart, I made the “These Boots Are Made for Walking” Dress as a tribute to my favorite cowboy boots. It was featured in The Sew Weekly’s Daily Spotlight for Thursday. You should’ve seen me…you would’ve thought I’d won the Miss America Pageant. I tackled button loops for the first time and made the “Not My Gumdrop Buttons!” Vest and a matching hat. 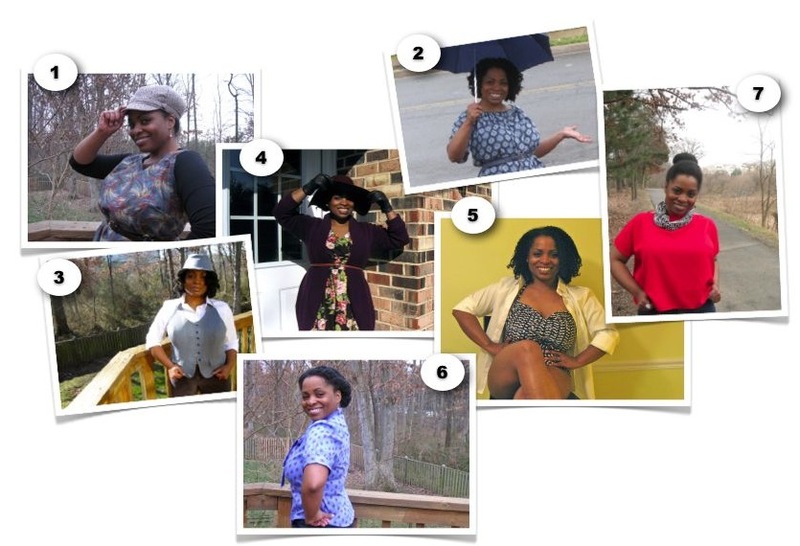 Week 4 Challenge: Make a garment from the Make This Look archive. My “Bird-less Garden Tour” Dress turned out better than the original. Week 5 Challenge: Down Under. Sew something inappropriate for the current season. I got the bright idea to sew swimwear and made the “Beach is Closed for Winter” Bathing Suit. It turned out to be a terribly stubborn, but useful prototype. Week 6 Challenge: UFO. Make an “un-finished object”. I made and fell in love with the “Likeable Librarian” Blouse. Week 7 Challenge: Red. A tribute to Valentine’s Day. The “Hip to Be Square” Top was a 1-hour miracle and rescued me from forfeiture. Seven weeks of cutting, altering, sewing, photographing, and blogging. I’m tired and invigorated. There’s hardly any time to admire (or tweak once complete) one’s work. Once it’s photographed and blogged, it’s on to the next one. Speaking of next things….on to them I go. This entry was posted in Editorials and tagged daily spotlight, najah-made, sew weekly challenges, UFO. Bookmark the permalink. Hey! Thanks for writing a blog post. I follow you on The Sew Weekly and have been hoping to find out more about your creations on your blog. I can’t imagine doing an project each week AND trying to write a blog about it, so I understand completely the sewing-no-blogging. Just wanted to let you know, though, that when you’ve got your sewing legs steady beneath you, there are people interested in what you’ve got to say about the process. Thanks for the encouragement, Tara. I didn’t know what I was getting in to with this whole thing, but I am LOVING the challenge, the support, and most importantly my emerging wardrobe. Now that I’ve got a decent sewing rhythm going, I think I can make time for blogging. There’s certainly plenty to blog about already.